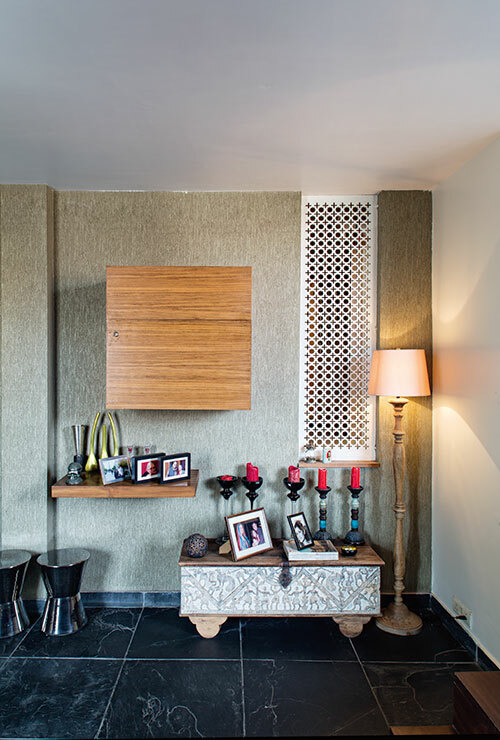 A super-sized ‘album’ of baby pictures lines an entire wall of the home of actress-designer couple Vidushi and Nikhil Mehra. And then the pet parakeets, fish and a frisky cocker Spaniel break your staring spell. This home completely revolves around the couple’s animal-adoring eight-year-old twins, quite adorable themselves. An old piano in the living room, left open, begs to be played. 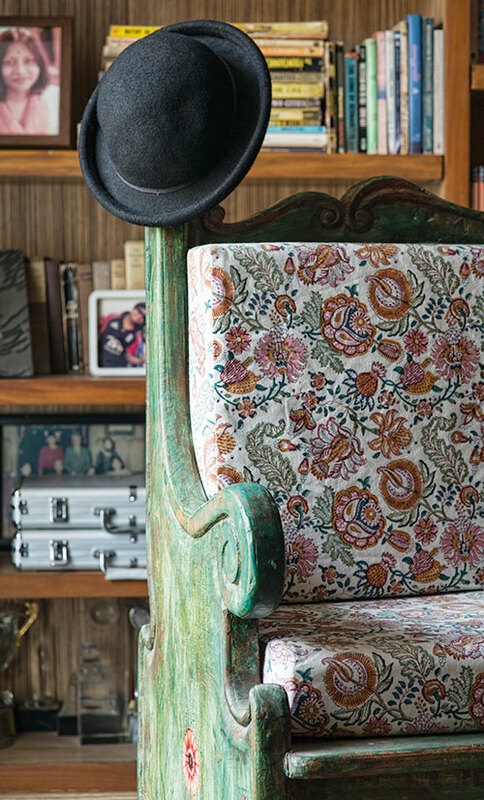 An antique clock squats atop hard-bound classics. Prittam Priyal Ochan is obviously a favourite — two large artworks of that artist catch the eye — striking, un-missable. A collection of charcoal sketches creates a perfect foil to all the colour. Three steps down, an old turntable and radio set serves as a table. Here, a wall with shelves replete with tomes all the way to the top beckons. Keats & Shelley, Catch 22, Atlas Shrugged, Mutiny on the Bounty…I spy many favourites; well-thumbed. Tennis trophies and framed family pictures take up the remaining spaces on the shelves. Another antique clock peeps out from in-between more books. The kitchen is literally bang in the middle of the home, with the living room (on two levels), where the Mehras entertain, to one side of it and the bedrooms and dining room on the other. 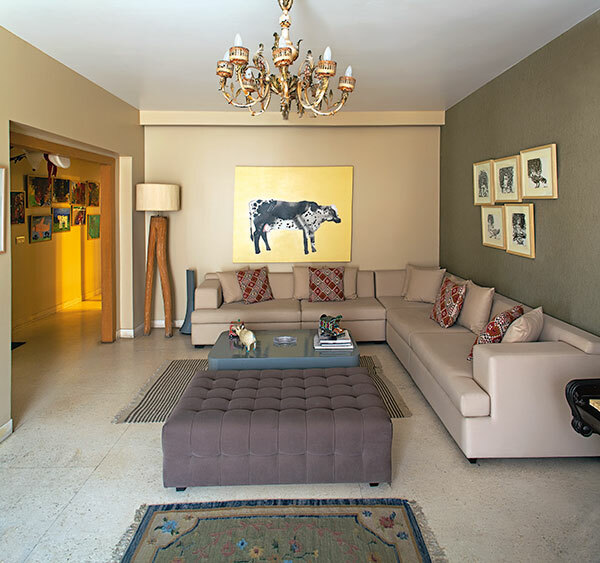 While the living room has many antique artefacts showcased casually around (football-breakable and otherwise), the part of the home on the other side, where the children probably spend most of their time, has a lot more functional furniture and accessories. My last encounter with Nikhil had been about a decade ago at his studio in Noida, UP, with his brother, Shantanu, of Shantanu & Nikhil. Vidushi, I had only encountered on the large screen in Aisha. Friends working in theatre spoke highly of her over-15-year association with theatre in Delhi, in particular of her role as Mary Magdalene in a production of Jesus Christ Superstar at the age of 16. 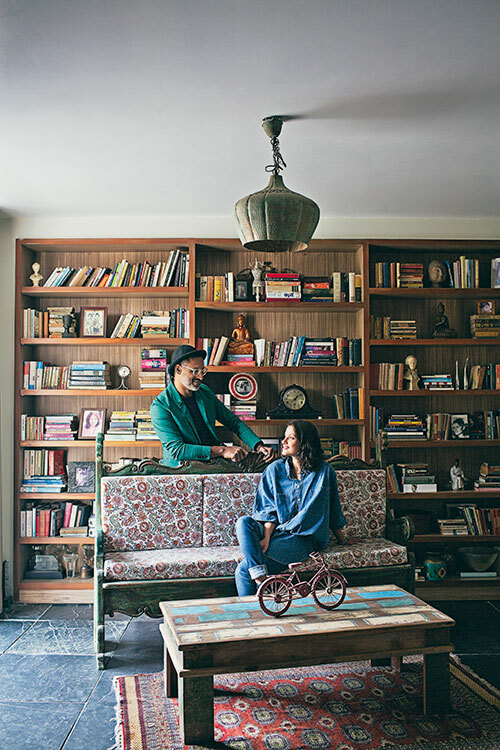 The pair had met through a common friend at a local bar in New Friends Colony in 2000, where Vidushi’s dungarees were what had caught Nikhil’s eye first! They found that they had common tastes in music — Led Zeppelin, Doors, Pink Floyd…. “We’ve never had a conversation on music since then!” Vidushi laughs. Some of the fashion-conscious males one would see donning Shantanu & Nikhil outfits would be Ranveer Singh, Shahid Kapoor, Abhishek Bachchan, Suhel Seth, Vijay Mallya…. “We work on our clients and take the personality of the person into consideration. Men are more loyal to brands than to their girlfriends!” asserts Nikhil. “We don’t do weddings. We don’t do films either.” “Even though he was approached for many projects,” adds Vidushi. “It eats into his time.” Time, when he has it, is spent with the twins and Vidushi. Just back from a long holiday in Orissa, beach holidays are what the Mehra family loves — Goa being a favourite. While they would ideally like to design and set up a home there, which they do contemplate now and then, for now they are still exploring the state, food and locations. Nikhil reveals that Vidushi has recently taken to karaoke with her friends and goes off to sing regularly, while he plays the acoustic guitar and they often have music sessions at their home. “His secret desire is to be in a band,” Vidushi says. Movie buffs, the two frequent theatres often. Before the children were born, four times a week was more the norm than the exception. Nikhil suddenly realises he has to rush for a meeting and takes off on his bike, dressed in a self-designed leather-on-silk jacket, and Vidushi rushes off to pick her children up from school. It is only on the way out of this delightful, surprising home that I notice the wall opposite the one with baby pictures — covered with framed artworks by the twins, carefully set, all the same size. Vibrant and whimsical, it is much like what I had come to expect, writ all over this home. Vidushi was right — fashion and action are so closely connected; there’s almost an overlap. In this home, it works. And the chattering parakeets seem to agree!